Fallout Vault 0 - a unique Vault in the Fallout universe. Unlike most Vaults involved in Project Safehouse, Vault 0 was not designed for experimentation. It was built by reinforcing the Cheyenne Mountain Complex in Colorado and was the largest known Vault. It was intended to be the core of the Vault Network. The aesthetic and technology used to build Fallout Vault 0 is unique among the Vaults. 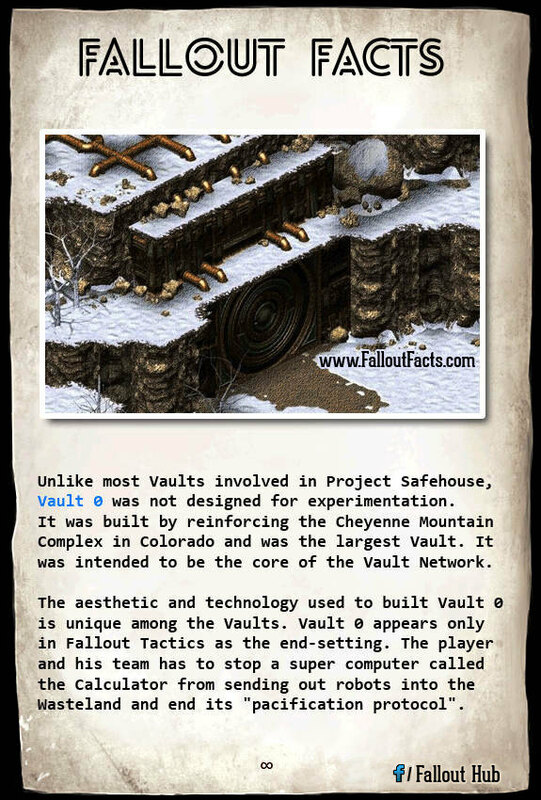 Vault 0 appears only in Fallout Tactics as the end-setting. The player and his team has to stop a supercomputer called the Calculator from sending out robots into the Wasteland and end its “pacification protocol”. In Vault 0 the geniuses of preWar United States were kept in cryogenic stasis; their brains were extracted and frozen. Hooked up together to the Calculator, their purpose was to design and cultivate a perfect human society in a post-War U.S. by educating the outside survivors. Due to budget cuts by the Department of Defense, important backup systems were not added to the neural network. As a result, the Calculator became corrupted and instead of releasing the robots to make the Wasteland safe for humanity, Fallout Vault 0 robots began to exterminate all life. As for the unlucky geniuses plugged in, most of them suffered severe brain damage and mental retardation from long term radiation exposure and because of their age. In Fallout Tactics, the player and its team have to stop the machine. Fighting many robots and encountering what's left of Fallout Vault 0's residents, who were severely brain-damaged, the Warrior ultimately reached the Calculator's main lair and... I have no idea, I haven't played Tactics yet, sorry, lol. The Cheyenne Mountain Complex is also the location of SkyNET from Terminator. Many further Terminator references are made throughout Fallout: Tactics. The complex is also a real military site housing most of the United States' missile targeting systems and missile defense systems and was also used in the TV series “Stargate SG-1” as the base of operations for the “Stargate” program.